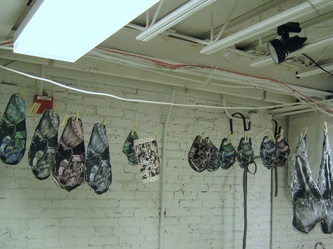 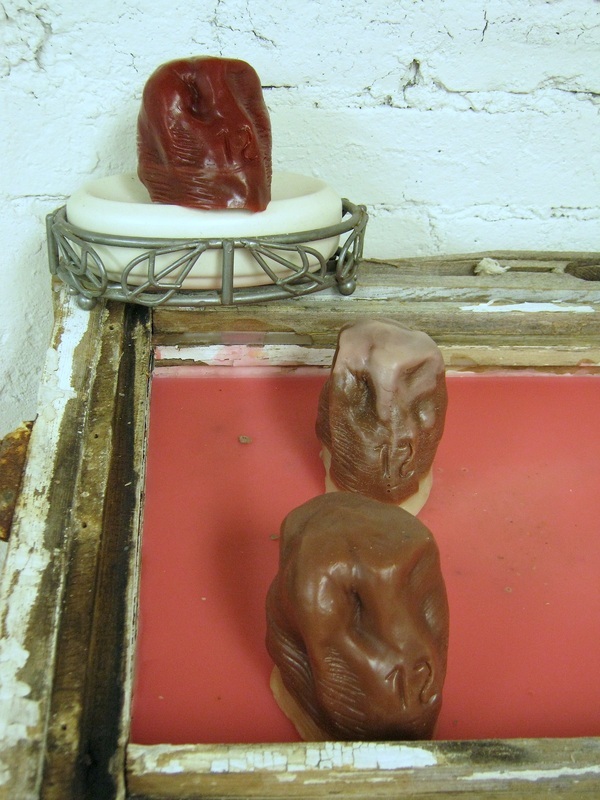 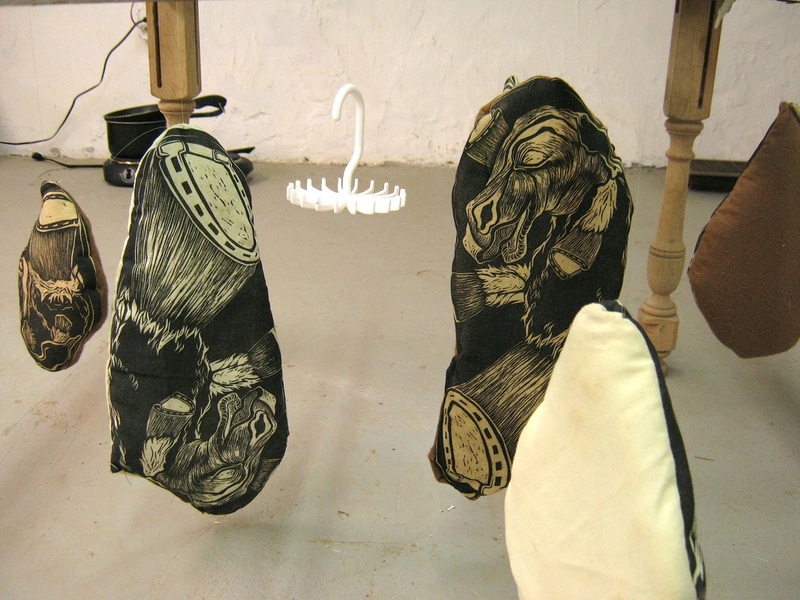 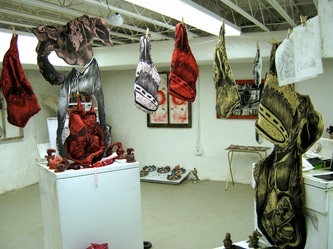 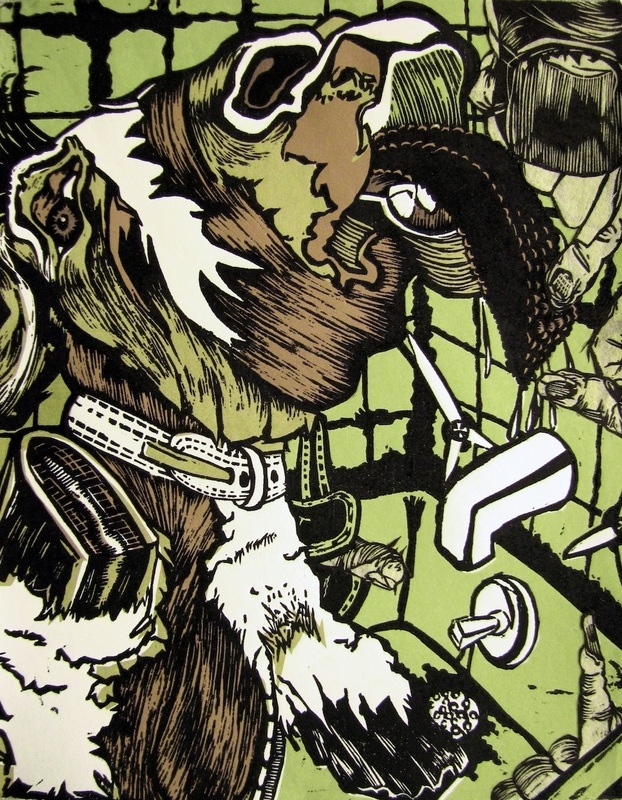 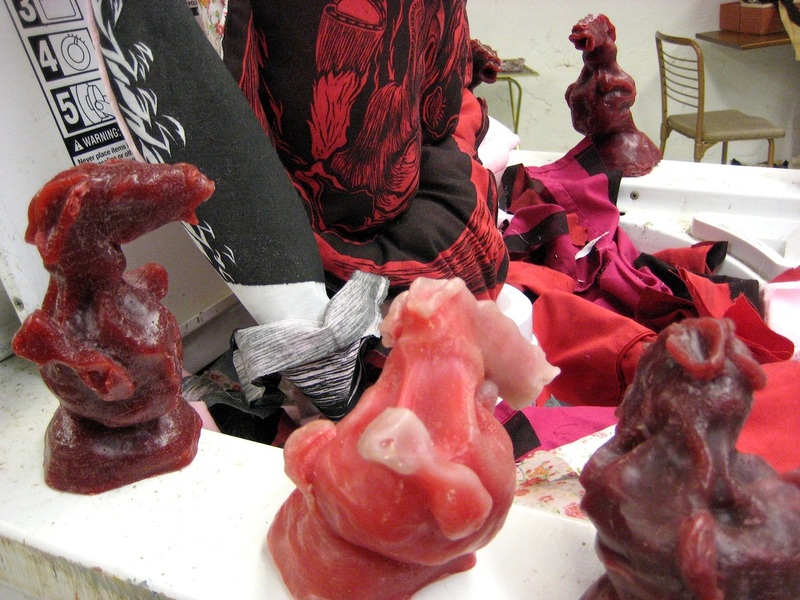 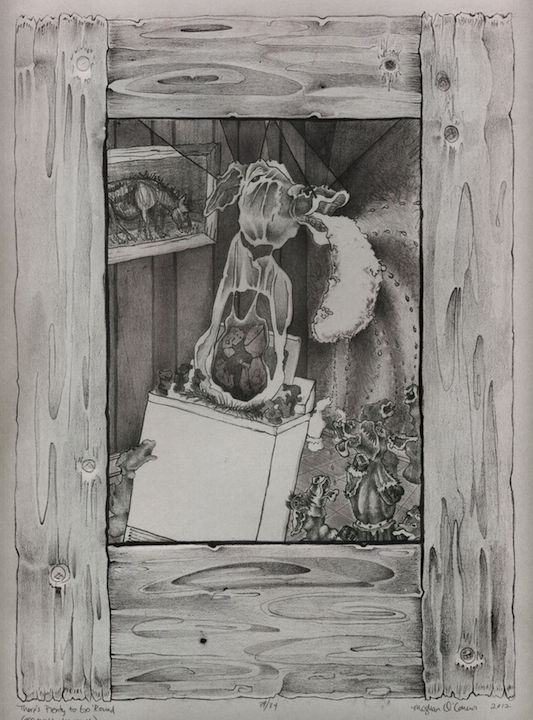 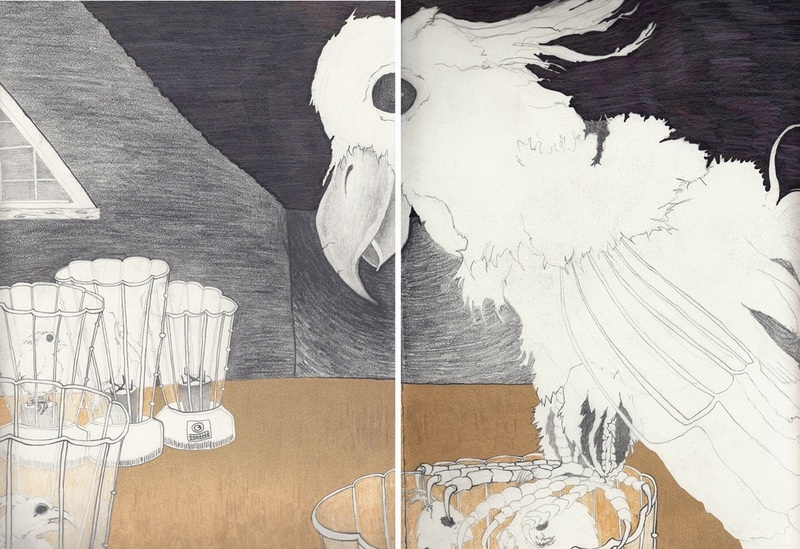 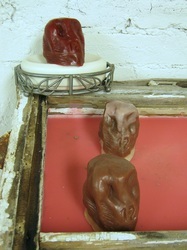 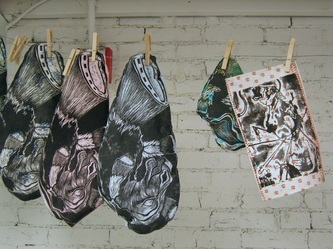 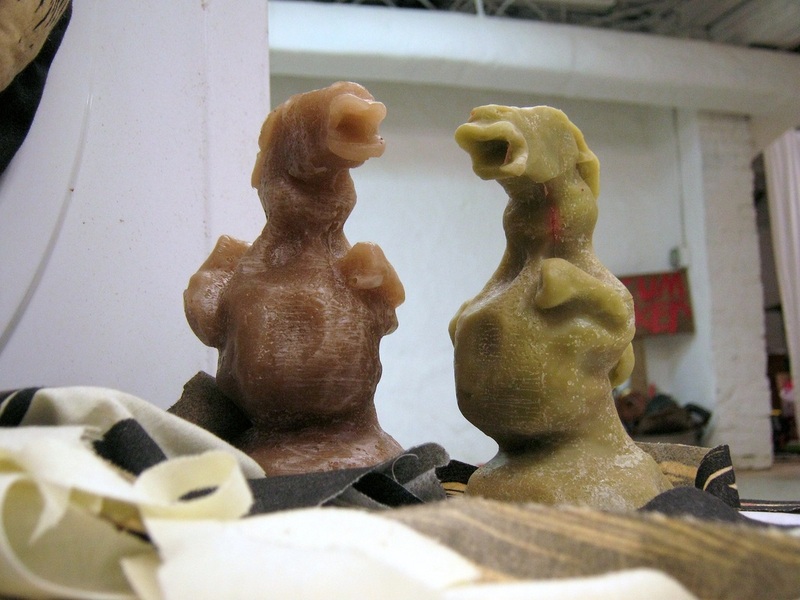 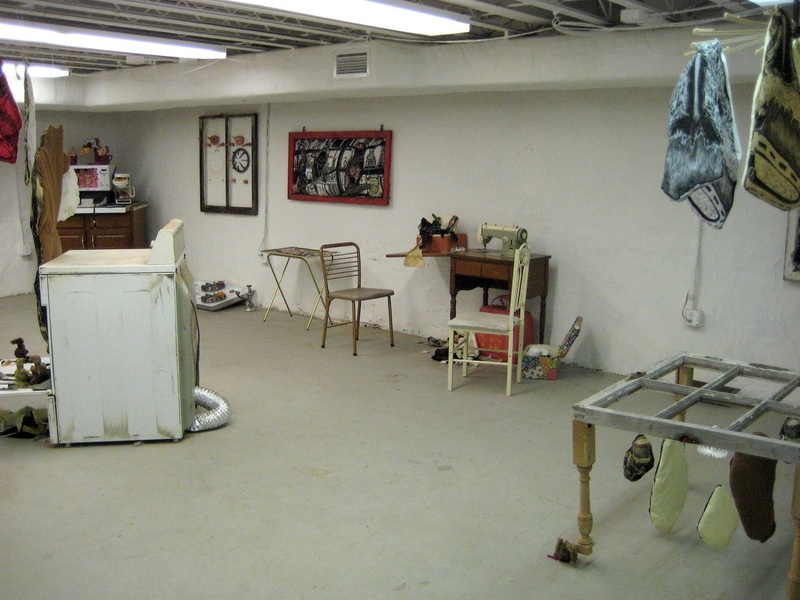 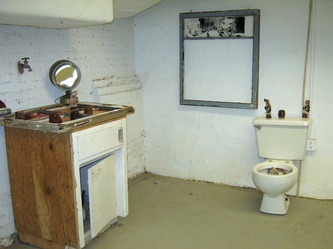 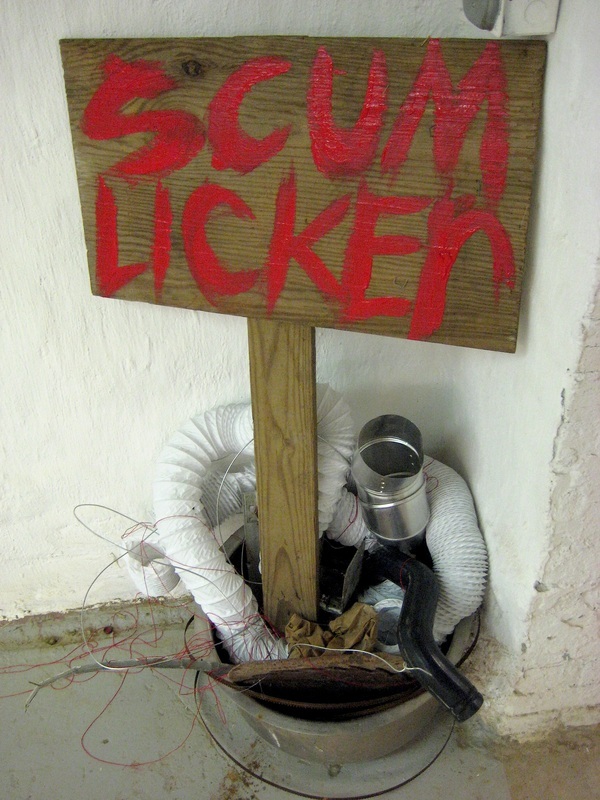 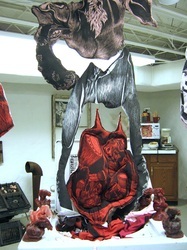 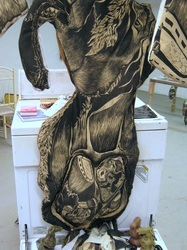 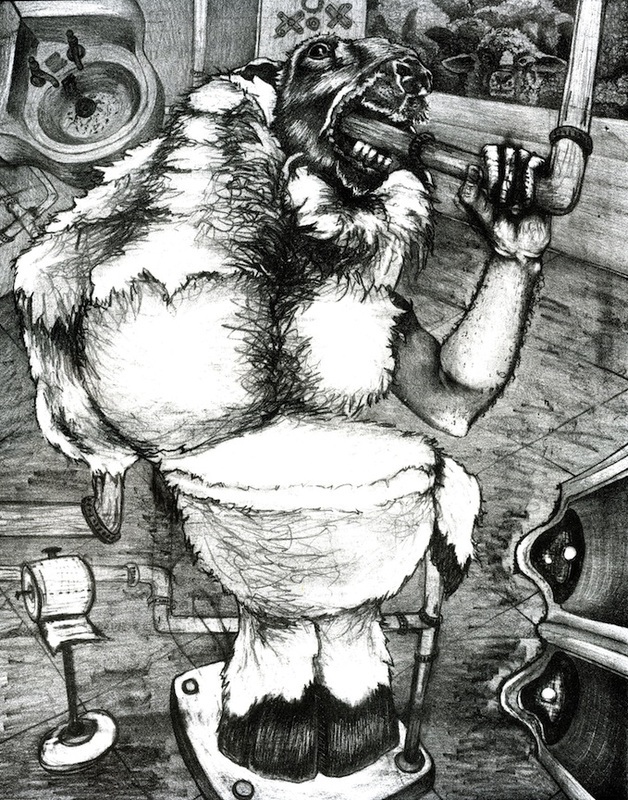 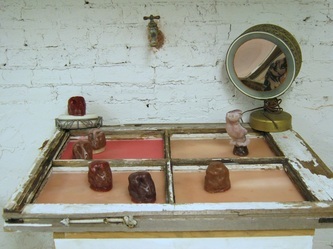 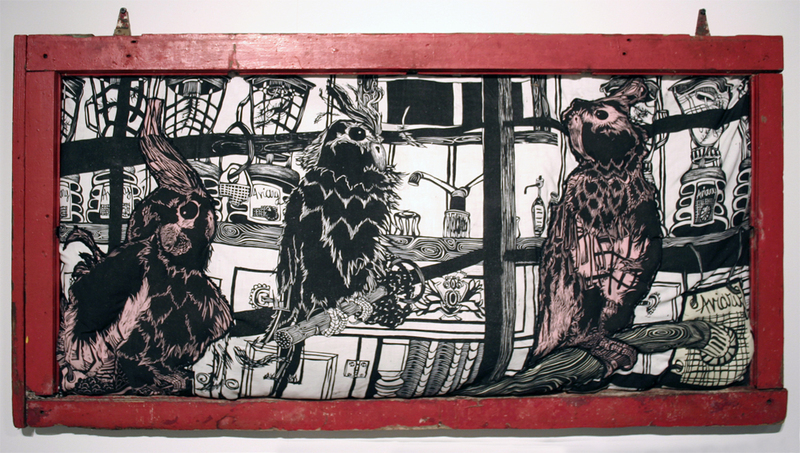 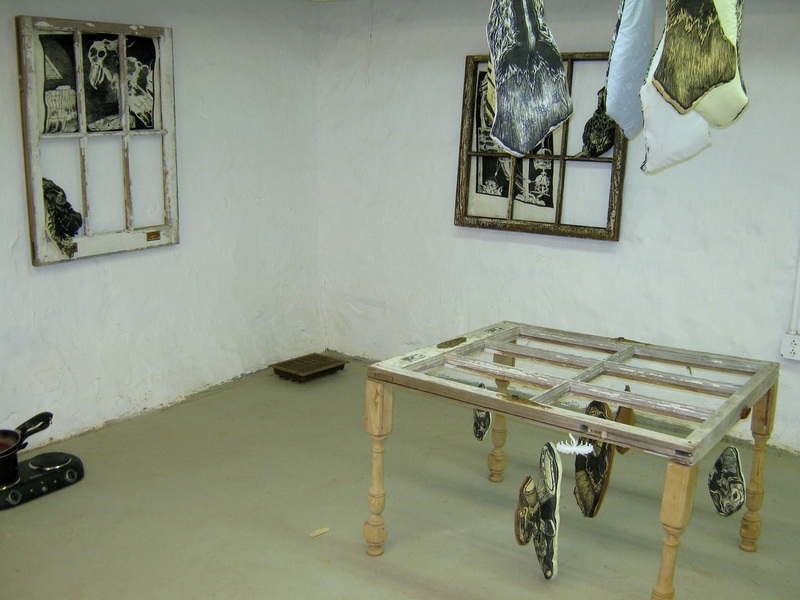 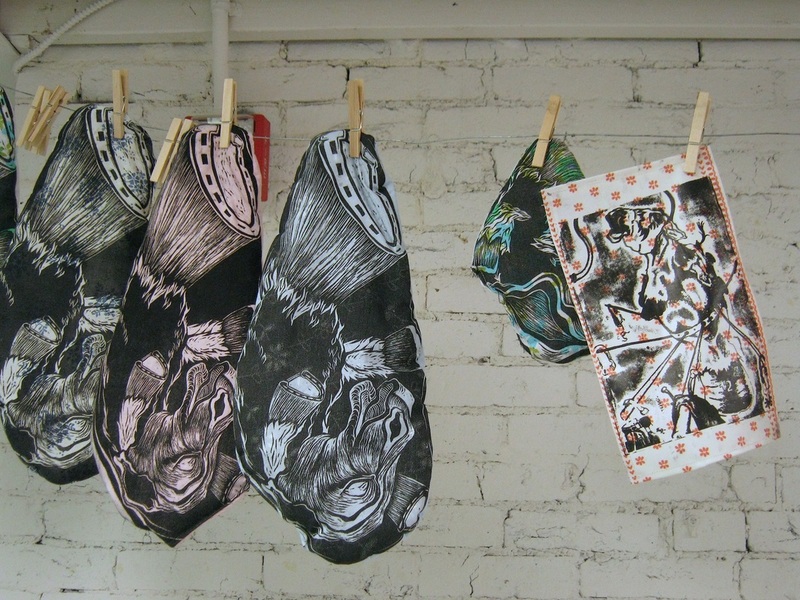 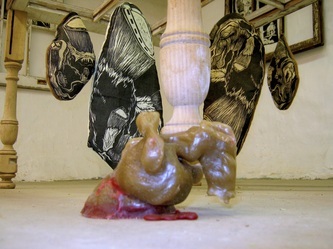 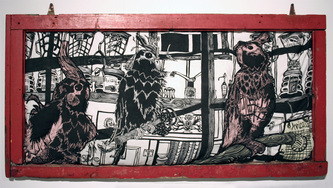 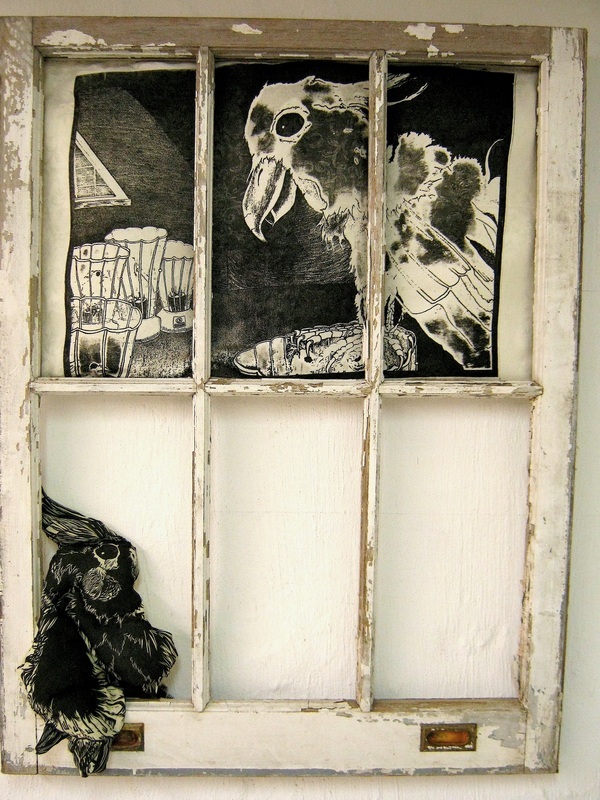 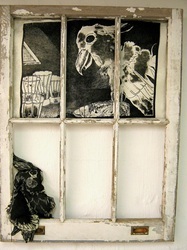 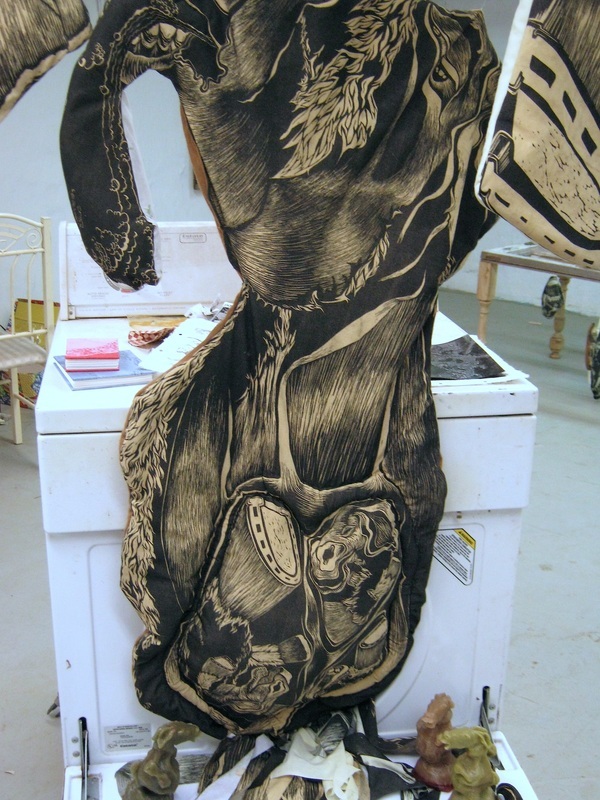 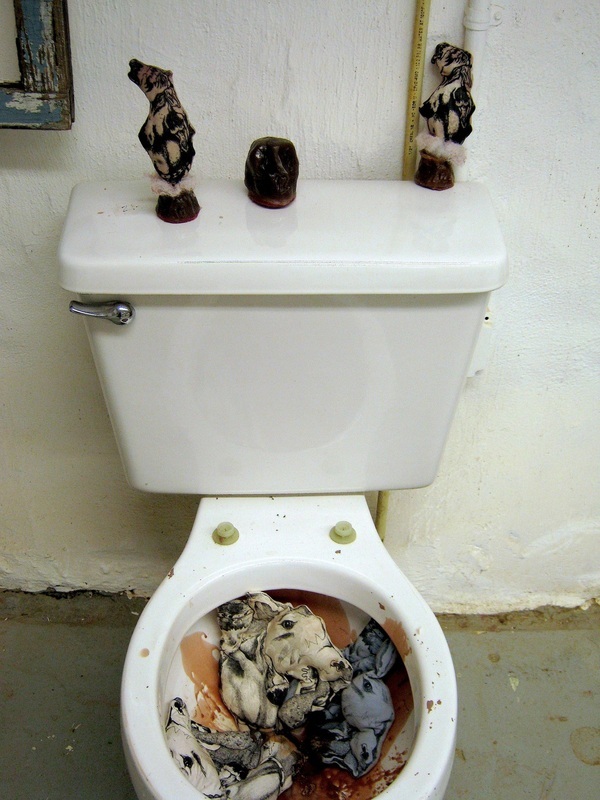 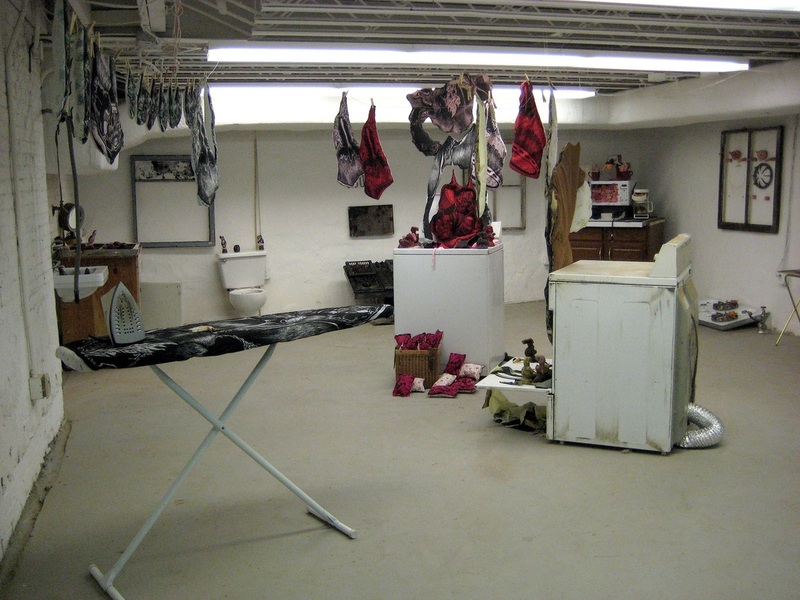 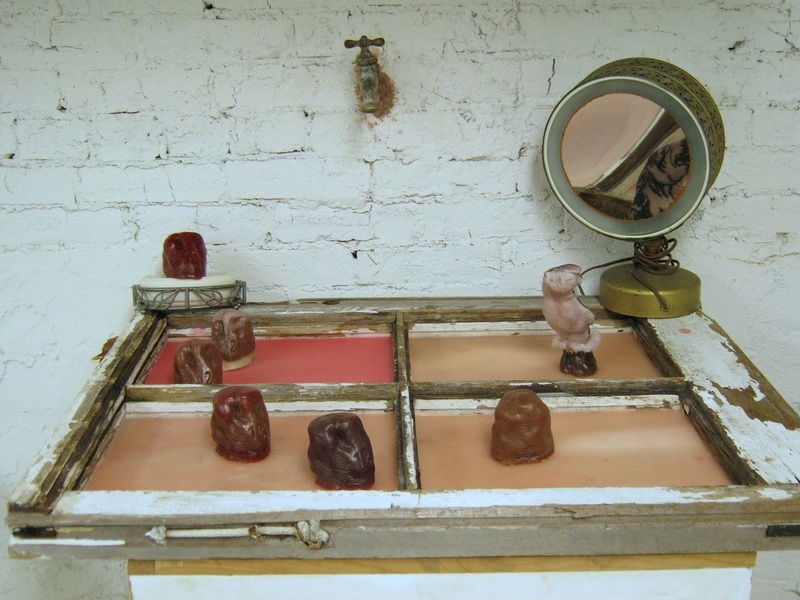 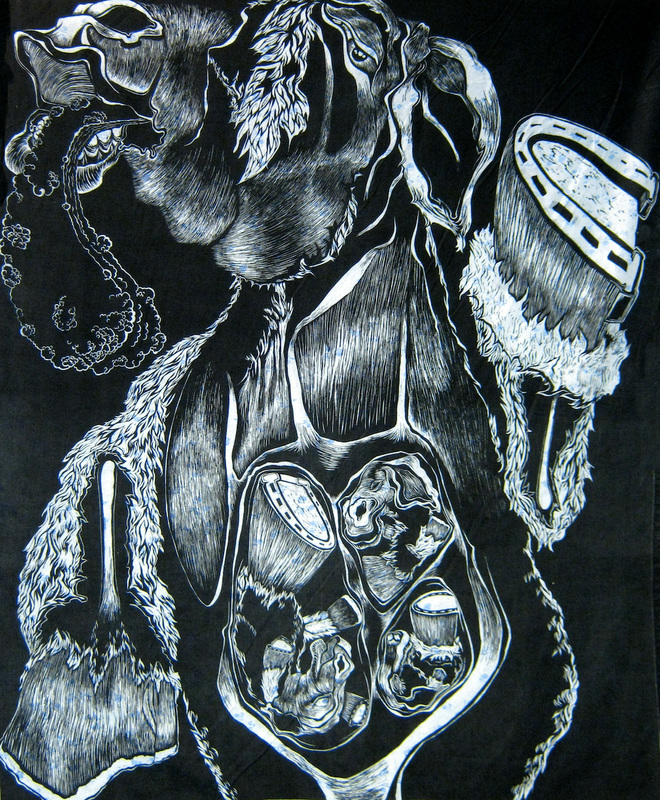 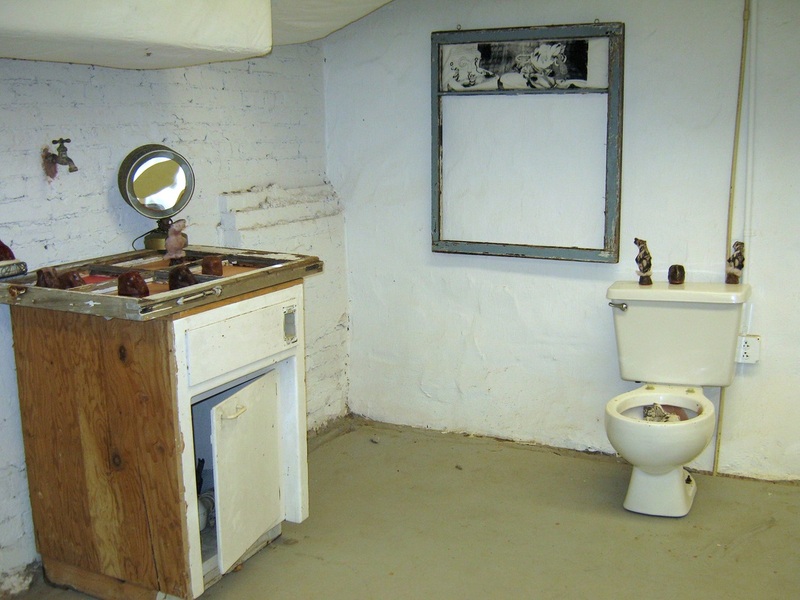 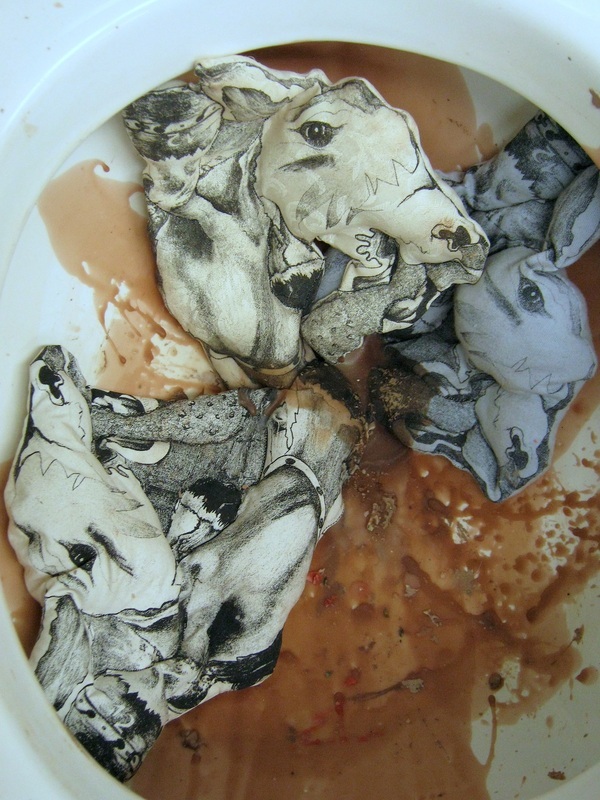 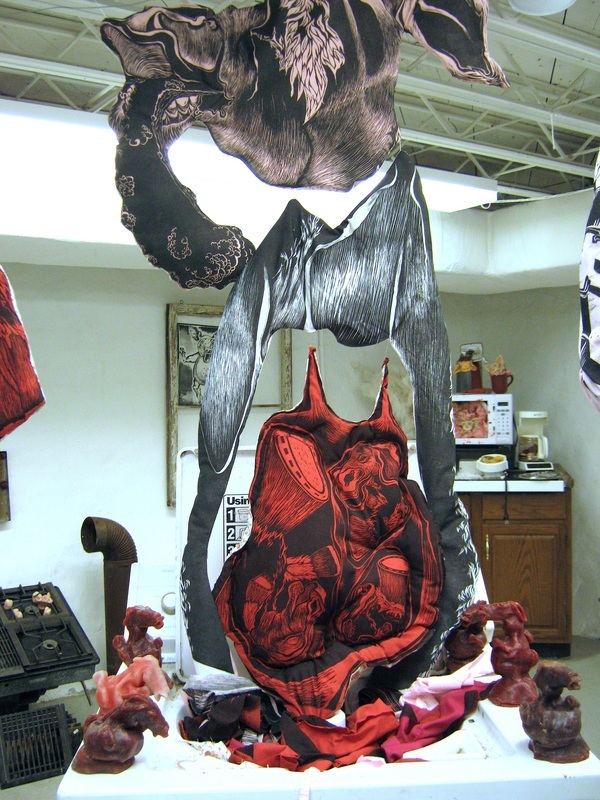 "Scum-Licker” is an installation, shown at the Lexington Art League in 2010, that incorporates animals and appliances, tied together by themes of domesticity, strife, and struggle. 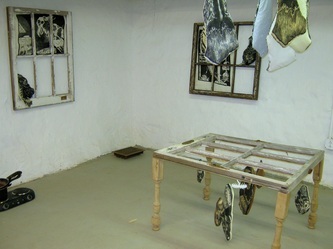 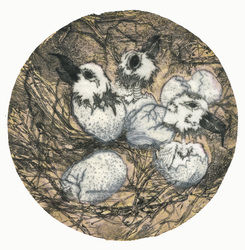 The appliances, furniture, and other household items are organized like an (un-welcoming) domestic interior, with the animal figures “inhabiting” the space. 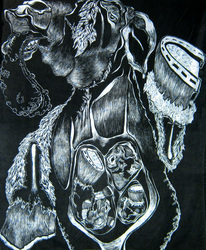 The result is a metaphor for the darker side of human nature. 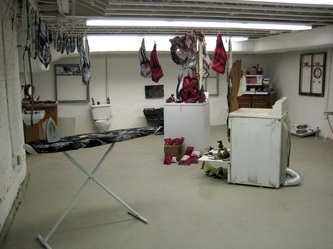 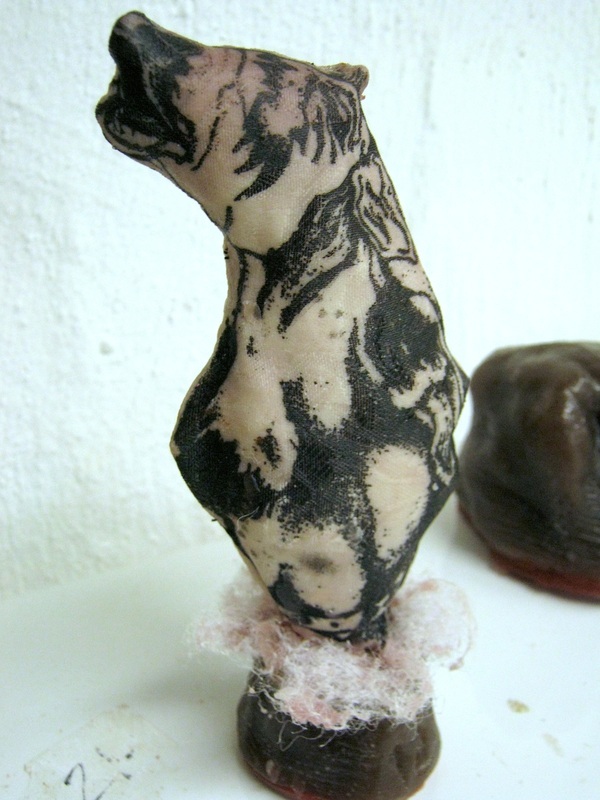 The entire show “Scum-Licker” is full of imperfections, from the figures and appliances to the space itself. 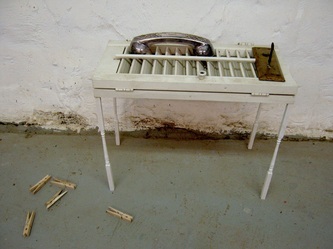 It is dirty and old with spiders and webs everywhere. 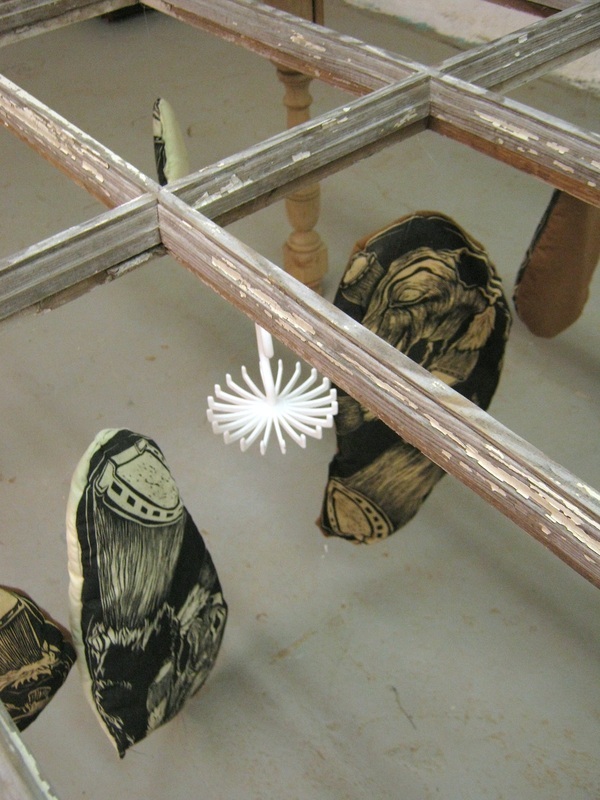 There is a precarious nature to the assemblage of each form: suspension with strings, carefully balanced table legs. 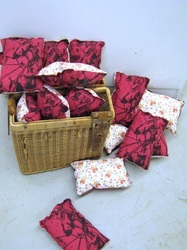 The figures themselves are handcrafted and sewn, represented in a manner which hearkens to cartoons, stuffed animals, craft pillows, or even taxidermy; but they are not soft and cuddly, nor welcoming. 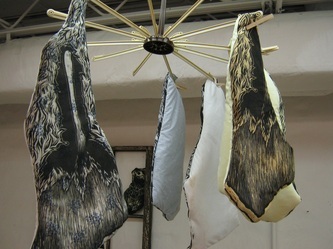 Instead they are aggressive in nature. Animals are coming out of machines, strung on a line like meat, often with an expression of agony/ ecstasy. 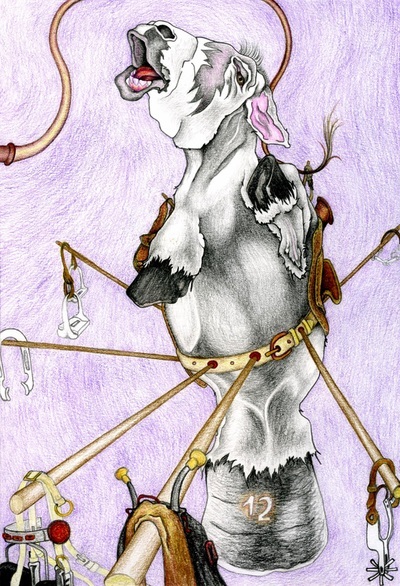 This show is meant to make us question what we do and how we act. 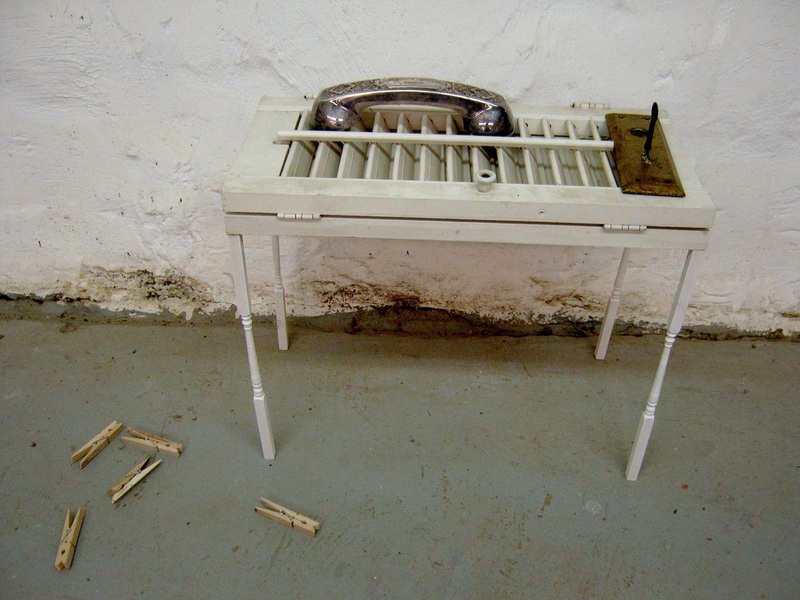 It is a metaphor for our self-destructive tendencies within human nature. We are the animals "licking the scum." The scum is self-destructive behavior. We know we should not, but we continue to lick the scum, why?